LED Power: 250W(Cree high intensity LEDs). Color Temperature: 6000K (4200K available). Current draw 3.0A @ 12V, 1.5A@24V. Operating temperature: -40~80 degree Celsius. Toughened glassLens with high transmittance. IP 67 Waterproof, Dustproof, Shockproof. Double Insulated Silicon Rubberized wire. 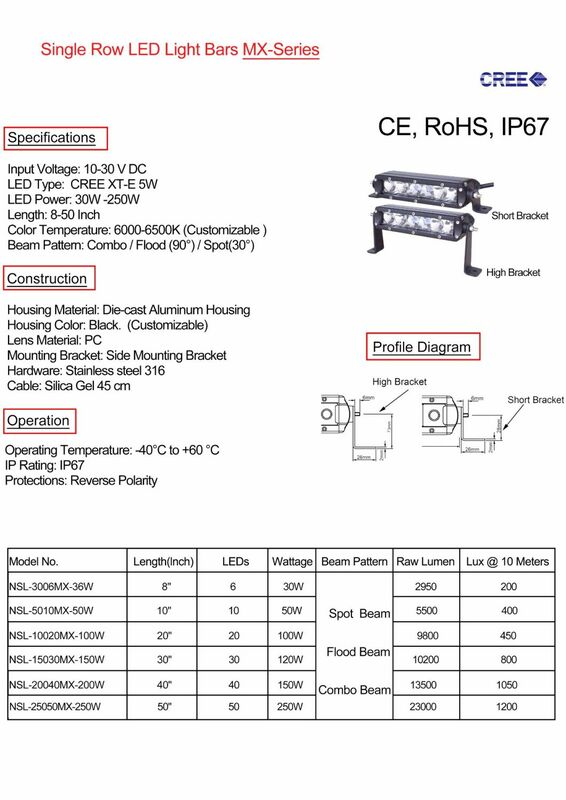 Application: NSL lights are designed for any device has a voltage output 10-30V (60V /70V)DC like Off-road vehicle, ATV, truck, wheel loaders, engineering vehicles(excavator, tree dozer, road roller, bulldozer, crane and mining truck etc. ), Special vehicles(fire engine, police cars, rescue vehicle, communication vehicle, military command vehicle)forklift, trains, boat, bus, and tanks etc.